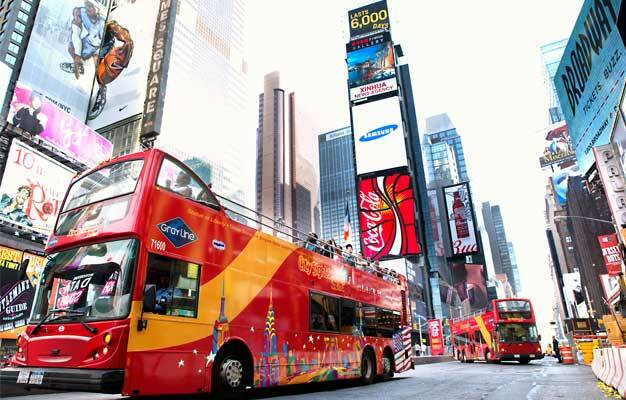 The Super New York Package allows you to experience the best of Manhattan with our Hop-On Hop-Off sightseeing buses with over 30 stops and connecting transfer points to switch from one tour loop to another. You can also use our Hop-On Hop-Off ferries and experience New York from the water. Your package includes ferry tickets to the Statue of Liberty and Ellis Land, the choice between admission to the Empire State Building Observatory or Top of the Rock Observation Deck, entrance to the New York Historical Society or the Museum of the City of New York and a free Eat and Play Card providing you with great discounts! This package also includes tickets for the Statue of Liberty and Ellis Island ferry plus your choice of tickets to the Empire State Building Observatory or Top of the Rock Observation Deck. In addition you'll get an entrance ticket for the New York Historical Society, one of America’s pre-eminent cultural institutions, which is dedicated to fostering research, presenting history and art exhibitions. Founded in 1804, the New York Historical is the oldest museum in New York City or the Museum of the City of New York, celebrating the city's diversity and evolution. You also get an Eat and Play Card, which gives you savings on your stay in New York on everything from dining, attractions, entertainment, shopping and more. Each card is valid for up to 4 people and can be used again and again for the duration of an entire NYC stay (up to 30 days). 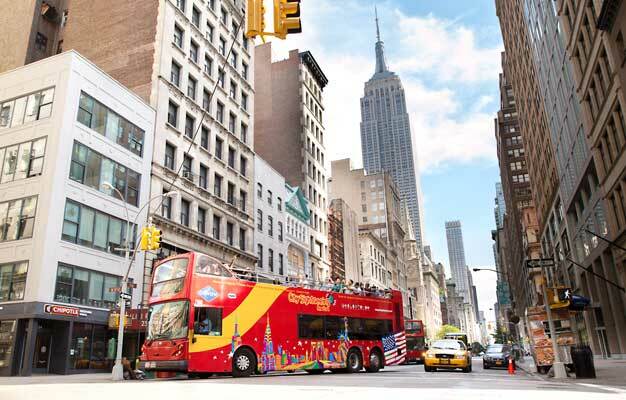 Shortly after your booking is complete your e-ticket will be send directly to your email, just print it out and bring it to Gray Line CitySightseeing New York visitor center, where you'll exchange it for your tickets. Hop-On Hop-Off bus tickets are valid for 72 hours from the time the ticket is issued at the visitors center. Tickets for the Statue of Liberty ferry,Empire State Observatory or Top of the Rock Observation Deck, the New York Historical Society or the Museum of the City of New York and Hop-On Hop-Off ferry are valid as indicated on the ticket stub. Night Tour: See New York when it sparkles! Enjoy the night-time views and ambiance of Midtown Manhattan. Also marvel at the memorable views of Chinatown, Empire State Building, SoHo, Little Italy, Manhattan Bridge, Brooklyn Bridge and more! (Not Hop-On Hop-Off). Lights of the Holiday Tour: During the holiday season the Night Tour becomes a "Lights of the Holiday" Tour, featuring animated window displays & holiday decorations at New York's famous department stores, giant tree at Rockefeller Center and Manhattan’s other unique sights during holidays.